The important difference between Windows 10 and its previous versions – a new policy on promoting services within the operating system. Earlier, when users purchase Windows, they were getting some service-packs and forget about further functional updates after that. But today the situation has changed drastically. Together with Microsoft services integration in Windows 10, promotion on free update, Windows-As-Service strategy, now we can see ads in operating system. We will see if it was a good move in the nearest future, but right now we are going to show you how to disable ads that annoy users in Windows 10. How to disable ads on the lock screen in Windows 10? Nowadays tablets and transformers gained a great popularity among users all over the globe and it means that the lock screen is used much more often now. Microsoft developers integrated two solutions for ads in this part of the operating system. How to disable ad banners? Windows Spotlight is a special service, which changes the images displaying on your lock screen. That’s a pretty useful option, but it also displaying annoying ads on the lock screen. In case you want to disable all full screen ads appearing (but still to be able to see specified images on the lock screen), you need to use applications like The Wall! Or Dynamic theme. At last, you can disable the lock screen at all if you don’t need it. Go to Settings –> Personalization –> Lock screen. In Background menu list select Picture or Slide show. 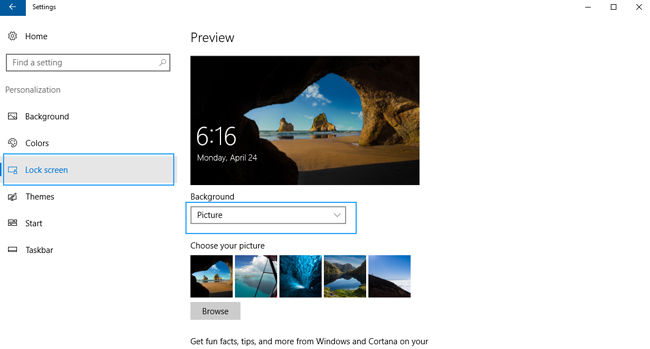 In case it’s needed, configure tools from Windows Store to change the image on the lock screen. How to disable test ads on the lock screen in Windows 10? Besides the full screen ads in Windows 10, Microsoft developers integrated an option to display tips, jokes and other information (and ads too). Turn off Get fun facts, tips, and more from Windows and Cortana on your lock screen. 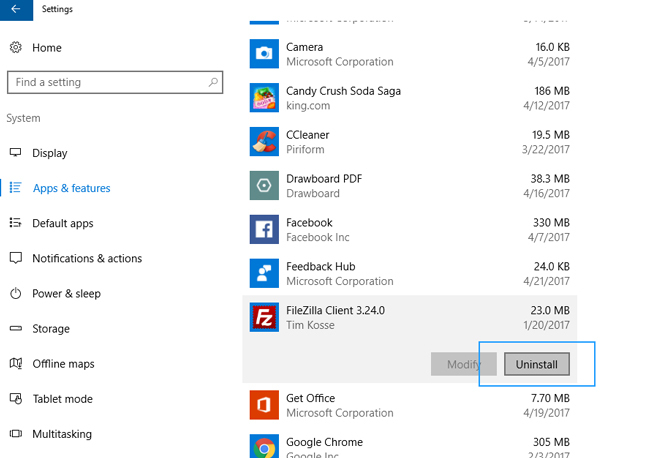 How to remove apps ads in Windows 10 Start menu? 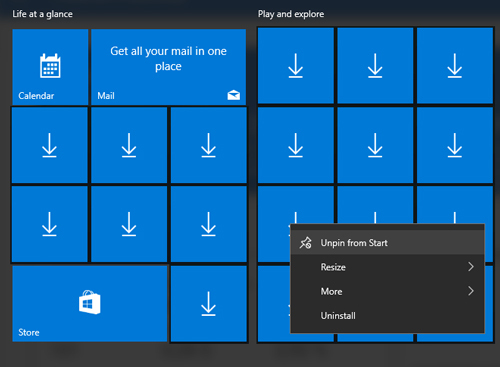 Start menu is one of the main parts of Windows operating system, and Microsoft developers decided to integrate some ad links for recommended apps here. On our opinion these one must appear only in Windows Store, so we want to clear the Start menu from such links. Go to Settings –> Personalization –> Start. Turn off Occasionally show suggestions in Start. From time to time Windows 10 can show you notifications with different suggestions. 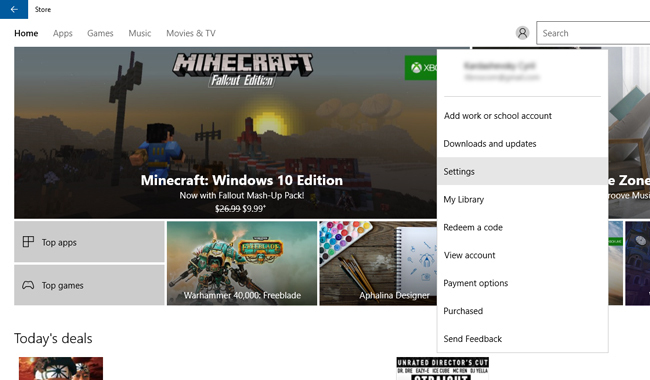 This one can invite you to use some system service or to switch Edge browser to use by default, but it also can propose you to purchase different applications in Windows Store. 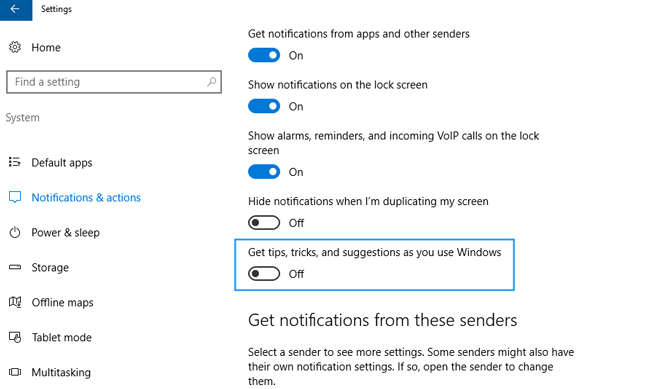 Go to Settings –> System –> Notifications & actions. Turn off Get tips, tricks, and suggestions as you use Windows. 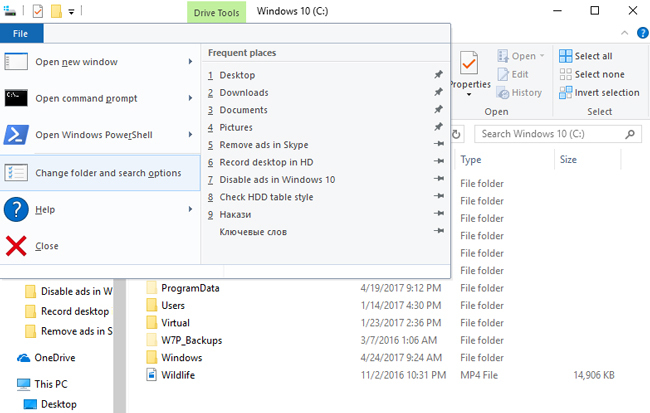 How to disable ads in File Explorer in Windows 10? 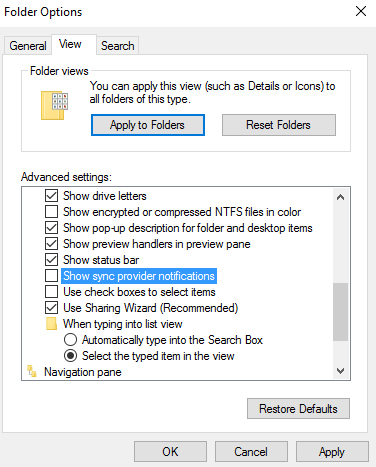 Click on File –> Change folder and search options. Find parameter Show sync provider notifications and check it off, after that click on Apply. Keep in mind, that together with ads you will stop facing with some other (and maybe important for you!) OneDrive notifications in File Explorer. How to get rid of the pre-installed third-party applications in Windows 10? How to disable pre-installation of third-party applications Windows 10? Do not connect to the Internet during Windows 10 installation process. During the first run, you will notice a lot of download icons in your Start menu. Right click on every of those icon and click Unpin from Start. Do not do anything with the applications, that was already installed (for example, Microsoft Solitaire Collection). After the first reboot, delete the applications that was already installed (like Microsoft Solitaire Collection). Reboot your machine once again and only after that connect it to Internet. How to delete pre-installed third-party applications in Windows 10? Go to Settings –> System –> Apps and features (in Windows 10 1607) or Settings –> Apps –> Apps and features (in Windows 10 1703). Click on the applications you don’t need and click Delete button to delete them one by one. 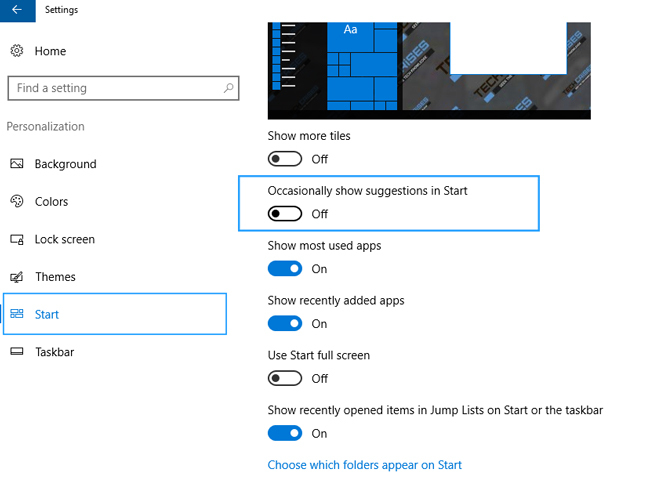 In Windows 10 Creators Update developers added an option, that saves settings of these apps during the system update. Now, in case you deleted these pre-installed applications in Windows 10 1607, they won’t be installed again after upgrading to Windows 10 1703. In case you perform a clean install, you should use the methods above to get rid of them or do it manually. How to disable ads from Windows Store? Go to Settings by clicking on account icon near the search field. 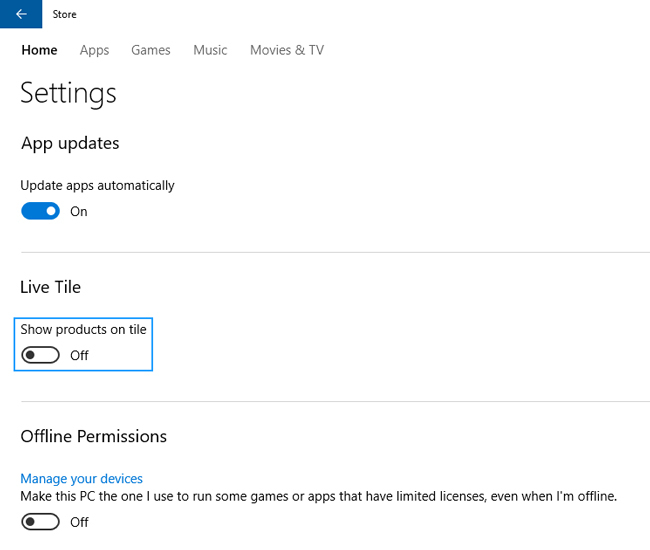 Turn off Show products on tile. How to stop Windows 10 collecting data about your ads experience? Besides ads displaying, Windows 10 also collects information about your experience when you are facing with ads. You are getting a special ID and Microsoft research your experience to show you more relevant ads. You can disable these functions during the installation or using system settings. Go to Settings –> Privacy –> General. Check off Let apps use my advertising ID for experiences across apps. As you see, all ads in Windows 10 can be disabled. We don’t sure if developers will do that in future, but it will be much more comfortable in case all the ads options would be at one place. But right now we recommend you to use these instructions to get rid of ads, recommended apps links and other advertising in Windows 10.